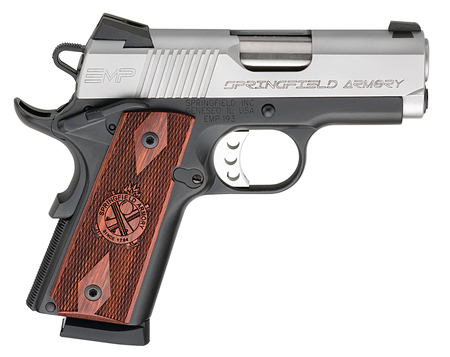 SAI Model 1911 EMP Compact 9mm 3 Inch Stainless Steel Barrel Tritium Night Sight Stainless Steel Slide Satin Finish Aluminum Alloy Frame Cocobolo Grips 9 Round. Stainless steel match grade bull barrel, fully supported ramp. Low profile combat 3-dot Tritium night sight. Skeletonized trigger. Forged stainless steel slide with satin finish. Forged aluminum alloy frame with black hardcoat anodized finish. Dual spring with full length guide rod recoil system. 1.12 inch Thinline Cross Cannon Double Diamond Cocobolo grips. Includes three blued magazines with slam pads.